5 Shelter Blogs Clichés | Does This Pen Write? I spend a lot of time browsing shelter blogs while sipping hateraid in a tacky plastic tumbler. You know the kind I’m talking about: stackable, cheesy and usually 4/$1. Perhaps being more craft aspirational than crafty has made me resent the well styled, impeccably edited spaces I view day after day. Or maybe I’m just tired of feeling marginalized because I don’t worship at the church of mid-century modern (because the mid-century was so great for my people). Though perhaps it’s just that my decor choices are just never going to elicit “oohs” and “ahhs” from snotty, New Yorkers who live in 80 sqft of pretentious elegance and all seem to own “Keep Calm and Carry On” posters. 1. 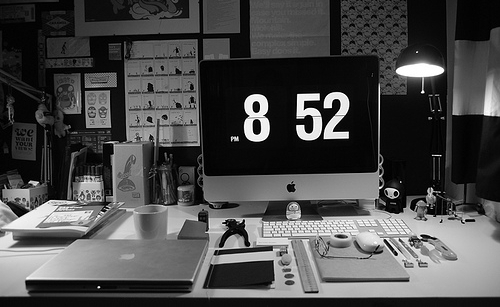 MAC Flip Clock Screensaver – The first thing I noticed when I started vigorously consuming shelter blogs was the ubiquity of this particular screensaver. Maybe I don’t get it, given the only Apple product I own is an iPod purchased seven years ago. Perhaps this was initially clever, but seeing it in practically every home office featured on Apartment Therapy – a site whose catty, classist, community often pronounce what seems like every identically styled loft as “unique” and well decorated – suggests it’s past its sell-by date. 2. Eames Rocker – You can’t swing a sheepskin – faux or real – without spotting an Eames Rocker or faithful reproduction (owners of reproductions must quickly acknowledge in order to receive their well deserved scolding to, “save up until they can buy the real thing.”) Never has so much self identity been wrapped up in a plastic chair, which isn’t particularly comfortable. I know I’m risking hot pokers and torches, but I’m just not that impressed with this chair. And you know I love me a plastic chair! 3. Books as Decor – Call me old fashioned, but I tend to view books as reference materials or entertainment. I don’t tend to think of my streamlined book collection as something that brings instant chic to unused corners in my home. Besides, I have no idea what chair works best with James Baldwin’s Another Country. That said, I love when people arrange their books in creative ways on bookshelves, in crates and even on the floor. So long as it doesn’t involve filling a hurricane jar with colored pebbles and placing it whimsically on top of the stack. 4. Frame Artwork Displayed on the Floor – I think the most confusing thing about this trend is how so many folks utilizing it do not lack for suitable wall space. I understand the very real concern regarding wall damage and landlords, but there is probably a display solution that doesn’t involve having your guests crawl on their bellies to view your collection. 5. Pets on Furniture – I adore dogs, but I think this is one of those trends that ought to be put to sleep. I have nothing but my experience on which to base this, but I feel like these fabulous spaces are probably inhabited by the same people who will claim in their Craigslist ad to be both a pet free and smoke free home. Do you peruse shelter blogs or magazines? What things are your tired of seeing featured? Upon hearing I was writing this post one of my friends said she never wanted to hear the word, “pop” as in: “white crown molding will pop against charcoal gray walls.” again. 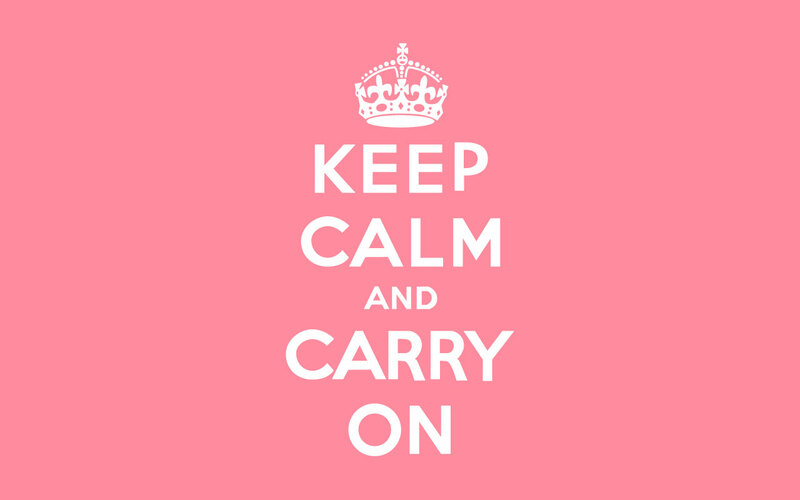 Okay, confession time- I have a keep calm and carry on poster. And I like it. 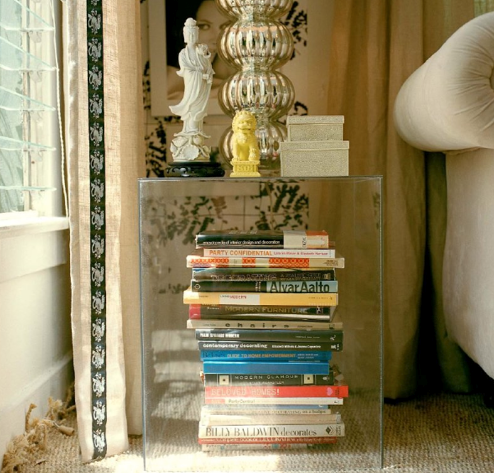 One of the things I see all the time in home blogs is book cases arranged by color. It drives me bat sh*t crazy. Every fiber in my booksellers soul rebels against it. Books are arranged by subject or not at all. Maybe by strict alpha by author. Anyone who arranges by color is not a book lover, just views their books as decorative objects. Also, people going on and on about the ‘great’ things you can supposedly make using pallets. Leads me to think that most of those people have never really come across an average pallet as actually used in shipping. They’re dirty, splintery, treated with toxic chemicals and by the time they get to me at my job in the receiving department of a large bookstore, often busted up. Also, they talk about how it’s recycling, but honestly- most pallets are used again and again. As pallets. And that’s as it should be. If you think the eames rocker is uncomfortable, you should try the Bertoia chairs that are also all over apartment therapy. Ouch after about five minutes. I have knockoff Eames eiffel tower chairs as my dining room chairs (like the rocker without the rocker base). Forgive me, but they were cute and cheap and not really all that uncomfortable. As for pets on furniture, if you can think of something that will keep my cat off the sofa, even when I’m not there, please feel free to suggest it. I do hate the art on the floor thing. It says to me, “I didn’t finish hanging my pictures” more than anything. It’s so interesting, because I really love books arranged by color. It’s a lot more efficient for me, which is the reason I’d organize my books at all, if they are arranged by color because of the way my brain processes things. But it’s definitely not for everyone! Thanks for commenting! Glad you stopped by. Books as decor is a total pet peeve of mine, too. Sorry, Snarky, but I can’t stand books arranged by color, because it doesn’t make sense as a system for me and seems really superficial. I arrange my books by vague genres. Well, this comment sounds sassier than I intended, but I can’t think of a nicer way to say “it seems superficial.” So I leave it. I’m not a big fan of cats, personally. Also my parents have two dogs who never get on the furniture and they have some really posh and super fab furnishings. I just think Pets on furniture is super gross, but then I generally think most people aren’t diligent enough with their household cleaning to have pets. Dogs generally can be taught to stay off furniture. They’re more interested in doing what people tell them too. My mom has always trained her dogs that they can be on the furniture in the family room but not on the furniture in the living room. I like my cat and my bird and if it’s a little messier around here than perfect, oh well. I can’t imagine not having them. I clean well if I’m having company but otherwise, it’s just me and the spouse 99% of the time. I could do without the “a coat of bright paint makes this object more interesting/better.” Small bird statues, skeleton keys, old wooden furniture, flooring. I am particularly put off by paint on old things that have inherent interest (to me) because I feel like somebody is just going to have to take all that paint off someday when the paint palette of the month club moves on. I don’t think that the pets in a lot of staged pictures are generally allowed on the furniture either. Look at that uptight dog on that light colored couch, it probably jumped down a second after the picture was taken. I feel like adding pets are an attempt to show how casual a space is, like having children coloring on the coffee table. I would also like to submit for the defense that I add a photo of said dog and the phrase “All items lovingly dusted with doghair by Pickles” to all my ‘Come get my free crap’ ads. I have a framed print on the floor in my kitchen…because I took it down a month ago to paint the walls and then never got around to painting. It’s sitting right there next to the can of paint and the unwrapped rollers, judging me for being lazy. Maybe I’ll just start acting like it’s a design element. 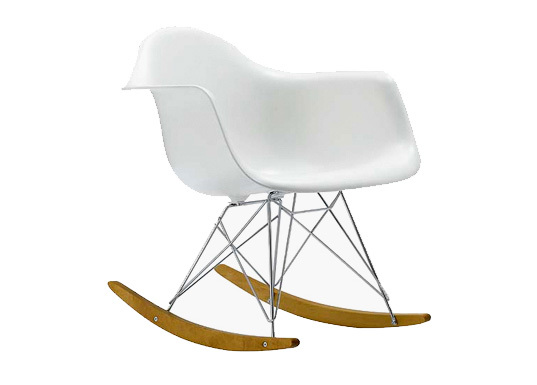 I must admit I love the Eames rocker in the limited colour that is out now, mostly because it reminds me of a storm. I can see the elements of crazy in the rest of the stuff. Jex – my kids prefer the walls to the coffee table (come to think of it, we don’t own one so maybe thats my problem). On the pets on sofas thing… I don’t even let my kids on the sofa anymore, those people must really love their animals! Seriously, the one sofa is almost in to the ground as they’ve used it as a trampoline so often, hence the ban, which was partial but as they can’t manage the no bounce rule they aren’t allowed on at all anymore unless under strict supervision. Sorry to be so slow on picking up this thread, I found it by accident when looking for a flip clock screen saver – Ha!